The good news is that Yomawari is the perfect Halloween game. And in The Long Night Collection, you get perfection twice over. 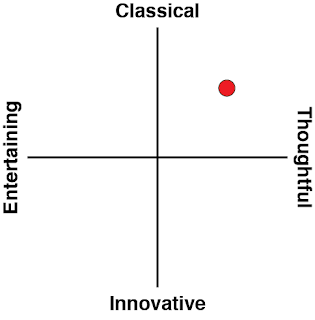 I've already reviewed both games in the past, when they were released as PlayStation Vita and PlayStation 4 titles. The Collection on Nintendo Switch is only a port of these two titles, but even as "just" that, this is incredibly good value, because these two little horror games are genuinely intelligent, worthwhile experiences. In both titles, you play as a child on the hunt in their local area for something lost to them. The context changes slightly across both games, but the themes really don't; this series' horror comes from imposing the supernatural over the mundane. It gives players a gauntlet of horrific spirits to avoid, while wandering around a suburbia that would, during the day, be perfectly benign. 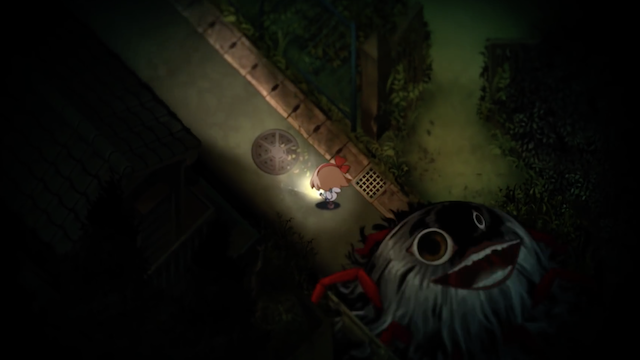 One of the most memorable things that I found about Yomawari is how so many of the spirits and monsters don't really have a sense of malice about them. 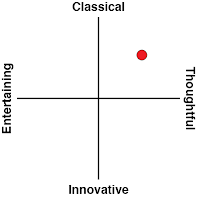 They lazily chase the protagonist, and are most certainly not good for them if they actually catch up, but for the most part, the sense that you get as you wander around the suburbs is simply that you're the one out of place here. Certainly, you're not being hunted, as such. You're just a bonus for the monsters if you just happen to be around. Night is the time for the spirits, and if a living human gets caught up in their evening movements and play, so much is the worse for them. This tone and theme is in part because the Japanese both have a fear and respect for the spirits, and Japanese culture has, for thousands of years, become tolerant with the perception that spirits exist all around them. They are often dangerous, but they co-inhabit the world. 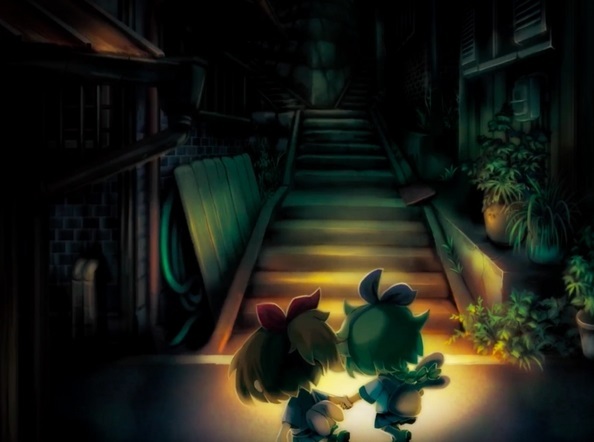 Mechanically, it means that in both Yomawari stories, the experience never feels hostile. One of the issues that I have with far too many horror games is the violent anger that comes across, as though there's something slightly misanthropic about the entire project. Zombies are ferocious, monsters are evil for the sake of being evil. Everything poses an extreme threat, and the protagonist is usually quite willing to grit their teeth, shout into the wind, and get violent themselves. But in Yomawari there's a more pervasive sense of sadness and melancholia, coupled with an overwhelming sensation of guilt. That guilt comes because of certain shocking scenes that I'm not going to spoil here, but there's such a lethargy to movement and the action in Yomawari that the game feels weighed down, rather than angry. In addition, your characters have almost no capacity to fight back. They can run (to an extent, and slowly), and they can hide if they find a bush to hide in, or a sign to hide behind. But that's all the tools they have at their disposal to survive the night. In addition to reinforcing the extreme vulnerability that your characters feel - both emotionally and physically - the lack of combat also reinforces the very Japanese aesthetic of Yomawari. To the Japanese, ghost stories and haunted houses are a long-running, hundreds (if not thousands) of years-long tradition. See, Japan gets very, very hot and humid in summer, and so the belief goes, a good horror story or haunted house sends chills down the spine, helping to take the edge of the heat. It's no coincidence that both Yomawari games explicitly take place in summer. You can tell because the soundscape is, for the most part, exclusively the sound of cicadas at night, which most Japanese will immediately tell you reminds them of summer. To put it in other words, these games are effectively haunted houses, and offer that same over-the-top sense of creativity with both the design and the minimalist storytelling, however dark and melancholic it gets at times. With no combat, a slow pace of movement, and minimalist storytelling, it can be hard to get a sense of what Yomawari actually stands for at times. If you look at something like Corpse Party - which offers a similarly simplistic top-down aesthetic - it's quite clear within moments of play that you can expect a mountain of text in what is effectively a visual novel. Both Yomawari titles are much closer to point-and-click horror adventures, or even top down "walking simulators", if you will. There's the occasional puzzle to figure through (often it's as simple as "how to find the right path to avoid these enemies"), but neither game is that interested in giving you an extended break from the breadcrumb trail that you're meant to follow. 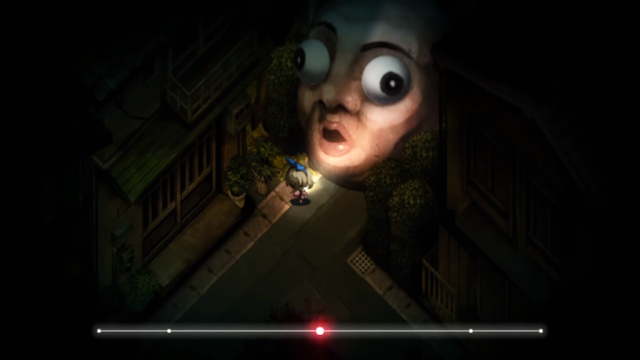 The problem with both Yomawari games is that they're perhaps a bit too subtle for their own good. Insofar as the games industry is concerned, "horror" means extreme bloodletting, extremely ugly monsters, intense action, and/or stories that are explicit enough to hit you with a sledgehammer. It's difficult for a subtle little ghost story that relies heavily on a very ethnic sense of horror to get traction in that. 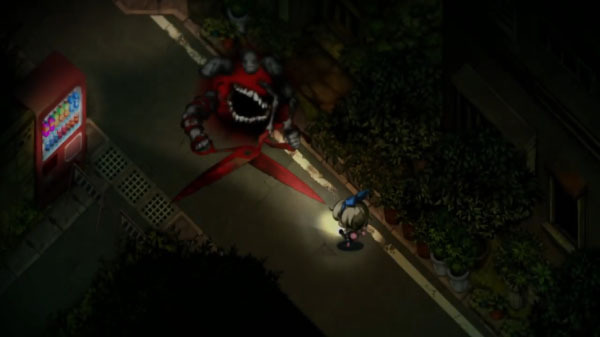 In Yomawari you rarely even get much of a glimpse of the monsters. They float in and out of the little beam of touch light that you'll use to guide your character quickly, and if you spend any real time looking at them, that's a sign that they're going to catch you and it's game over. If you go into Yomawari with the right spirit (hah, I had to get one pun in there), both of these games are memorable, beautiful, elegant and often chilling. They've never looked better than they do on the Nintendo Switch's screen, which is the perfect size for a top-down, sprite-based game like this so that you can make out the details without feeling like the art is too "stretched." And in the Long Night Collection, you get both games in one. Bargain!